Armenia’s Eurovision 2016 representative Iveta Mukuchyan waved a flag of the Nagorno Karabakh Republic (NKR) during the voting recap at last night’s first semifinal where she qualified for the final along with representatives of nine other nations, including Azerbaijan. 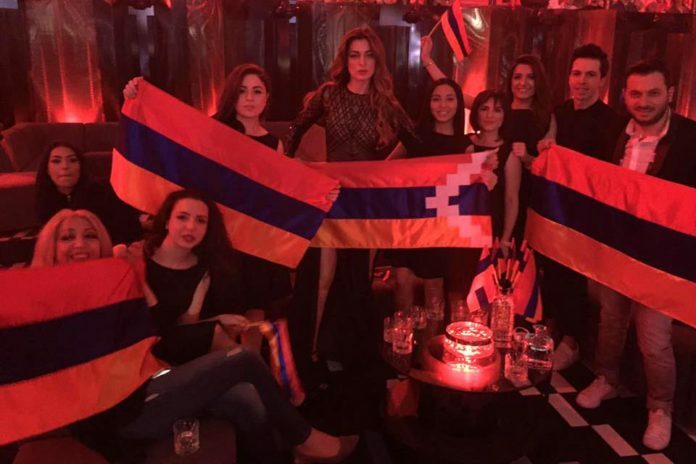 The presence of NKR flags and other attributes of the international unrecognized Armenian republic at Eurovision shows has long been an issue and organizers of the popular song contest held in Stockholm, Sweden, this year made conflicting statements ahead of the event last week. According to what appeared to be their last clarification, the NKR flag was not banned at the competition that is known to strive to avoid politicization. According to wiwibloggs.com, the world’s most read independent website devoted to Eurovision, the 29-year-old Germany-based Armenian singer said at a semifinal winners’ press conference afterwards that since she represented Armenia, her heart, thoughts and feelings were with her nations. “Even though 150 million people are watching, my thoughts are with my Motherland,” Mukuchyan declared. Armenians and Azerbaijanis, who are locked in a bitter conflict over Karabakh, saw another flare-up of violence in the region in early April. Scores of soldiers were killed on both sides in what proved to be the heaviest fighting since the 1994 truce. The contest will proceed with a second semifinal on May 12 before the May 14 Grand Finale that is going to feature 26 nations.